Mt. Kailash, 6,740 m. is situated to the north of the Himalayan barrier, wholly within Tibet It has the unique distinction of being the most Mount Kailash venerated yet least visited of the world's major holy places. The mountain is the supremely sacred site of four religions and billions of people. Because of its remote location in far western Tibet however, the mountain is visited by no more than a few thousand pilgrims each year. There are no trains nor planes going to the region, and by land there are only three, long and difficult, routes. Even today, with rugged over-land vehicles the journey takes weeks, and you must carry all your gasoline and supplies for the entire journey. 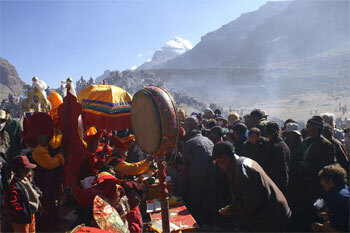 The primary purpose of one's pilgrimage to the Kailash region is the ritual circumambulation of the sacred mountain. This undertaking is called parikrama in Sanskrit or kora in Tibetan. Hindus and Buddhists travel in a clockwise direction, while the Bon-po travel counter-clockwise. The traditional parikrama route is 52 km long and can be done comfortably in three days. Some extreme enthusiasts, however, perform prostrations for the entire journey, meaning they travel the route on their hands and knees. This slow and painful rite takes between fifteen and twenty days. On your journey,you will encounters multiple holy peaks: Ravana Parvat, Hanuman Parvat, Padmasambhava, Manjusri, Vajradhara, Avalokiteswara, Jambeyang, Shavari, and Norseng. One continues through Dhira Puk, Shivasthal, and eventually to Dolma, which, at 18,783 feet (5725 meters) is the highest point on the voyage. This pass is said to belong to Deviparvat and is spiritually very significant. Day 13(30.05.14): Drive to Kerung: 6-7 hr. Day 14(31.05.14): Drive back to Kathmandu (150 km) 9-10 hr. Day 15(01.06.14): Transfer to airport for your onward flight. Morning after breakfast leave Kathmandu to commence yatra to Nyalam [3750M]. We reach Friendship Bridge [Nepal – China Boarder] by mini-coach. Walk along for 10 minutes to cross the bridge and there get acquainted with Chinese guide and land cruiser drivers. They will give a brief information regarding the further trip then proceed the journey to Zangmu, where all the immigration and custom formalities are ought to be accomplished. After the accomplishment of all formalities, we proceed to Nyalam. Arrival at Nyalam and overnight stay at guesthouse. The longest driving day starts with full of excitement, by the late afternoon you can have the first sight of Holy Kailash Parbat and Manasarovara. Hore, a small village near by Lake Manasarover. Day 13: Drive to Kerung 6-7 hr.